Airline Transport Professionals (ATP) has exercised options for 10 additional new Piper Archer TXs, bringing to 25 the total number of the single-engine training aircraft ordered by ATP so far in 2013. Piper and ATP jointly made the announcement on the first day of 2013 AirVenture Oshkosh, held July 29 to Aug. 4 in Oshkosh, Wisc. The 10 Archer TXs in the most recent order will be delivered in 2014. Airline Transport Professionals is America's largest flight school, specializing in airline pilot training and pilot career development. 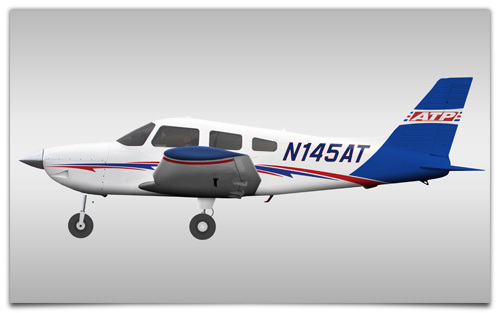 Under the 100-airplane deal announced earlier this year, ATP has options for 75 more Piper Archers. "Clearly, this large follow-on fleet transaction demonstrates that ATP values economy, performance and reliability. It also reinforces Piper’s recommitment to providing future pilots with excellent learning platforms as they become aviation enthusiasts," said Piper President and CEO Simon Caldecott. "These new Piper Archer training aircraft will support ATP’s continued expansion with new training centers in Portland, OR, Seattle, WA, McKinney and Houston, TX, and St. Louis, MO," said ATP Vice President Jim Koziarski. The airplanes ordered will be part of ATP's fleet as it transitions to predominantly Piper training aircraft. The latest order is in addition to a 30-airplane Piper Seminole fleet option placed with Piper by ATP in 2011. As a classroom, the Piper Archer provides everything needed to learn to safely fly. Standard instrumentation includes the Garmin G500 glass cockpit system, a perfect mixture of low workload and high technology. Piper's specially created flight school interior, designed to withstand the rigors of flight training, is standard, and the option for factory-installed air conditioning adds to the Archer’s appeal as a training aircraft. It is powered by the 180 hp Lycoming 0-360-A4M and offers 128 ktas / 237 km/h cruise speed. In 1984, ATP pioneered accelerated, professional multi-engine flight training with an emphasis on pilot career development. Today ATP’s Airline Career Pilot Program prepares pilots for airline careers with nationwide flying experience in multi-engine aircraft. In partnership with the leading regional and national airlines, ATP offers its students an airline-sponsored career track from zero time to 1500 hours, with CFI job placement and airline employment. ATP flies over 9,000 hours to provide more than 350 FAA pilot certificates every month across 28 locations nationwide. As America's largest flight school, ATP provides more pilots to the regional airlines than any other single flight school, college, or academy.